The constellation Sagittarius (The Archer) is drifting closer to the western horizon as Winter approaches. In January, it will set with the Sun and retire from the evening sky. Sagittarius is a Summer constellation, and will return to the early night sky next Spring. 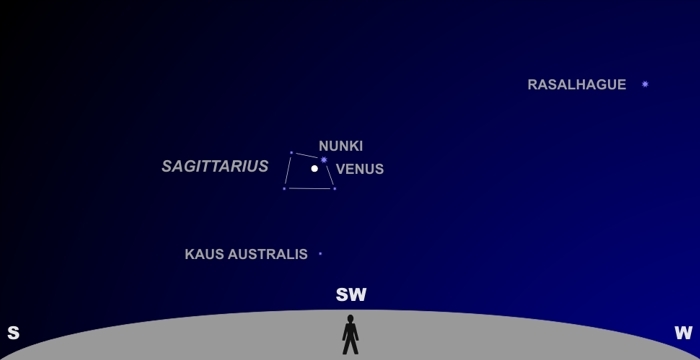 On its way to retiring in the west, it will be met by brilliant planet Venus in a close conjunction with Nunki. Venus and Nunki will be only 9.2″ (1/3 of a Full Moon diameter) apart at closest approach on November 18th. The pair will be relatively low in the sky, with an elevation of only 18°. That’s about 3 fist-widths (at arms length) above the horizon. If your sky is clear, and your horizon unobstructed by buildings or mountains, you should be able to see the 4 brightest stars that make up the “Teapot” asterism in Sagittarius. The other stars that make up the “Archer” shape are too faint to be seen in anything less than ideal conditions. Nunki will appear the brightest, at magnitude +2.0. It’s a hot blue star, intrinsically 600 times brighter than the Sun, but 228 light years distant. If you have a really good view, you just might spot Kaus Australis, a mere 8° above the horizon. It’s a white giant star, 143 light years distant, and also part of Sagittarius. At magnitude +1.8, it’s slightly brighter than Nunki. But its lower elevation will make it dimmer due to atmospheric extinction. Because it’s so close to the ecliptic, Nunki can be occulted by the Moon and (less frequently) by the planets. The last occultation of Nunki by a planet was on November 17, 1981, when Venus passed directly in front of it. This time it will be close, but not quite exactly aligned. Still, it will be a visually striking conjunction. If you’ve never observed an occultation telescopically, check out this video. It shows an occultation of Jupiter by the Moon, with the motion at 5X real speed. Since the Moon and planets move at different speeds through the sky, and are all near the ecliptic, their paths will occasionally intersect. The Moon is a fairly large object, subtending a diameter of 0.5°, so lunar occultations are not that uncommon.